We pick you up from at 7:30 to 8:00 for departure, we journey to Halong City. Upon our arrival we embark on a boat trip among some of the spectacular limestone peaks – time to relax and appreciate the sublime beauty of the bay. Those are feeling energetic and wish to get a close view of the scenic floating village of Cua Van can take a delightful kayaking ride around the village. In the evening we indulge in the uniquely fascinating nature as we stay overnight on our boat. (Breakfast and lunch are included). Leaving Halong Bay, we drive due north to Cai Rong Island. In Bai Tu Long Bay we enjoy a beautiful boat trip among the spectacular limestone peaks. Weather permitting, we take a kayaking ride through stunning rock formations and fishing villages. At our warm and friendly lodge we have the opportunity to learn to make traditional Vietnamese Spring Rolls and succulent fish dipping sauce and Squid dish. Tonight we stay overnight in our comfortable lodge. (Breakfast, lunch and dinner are included). Next, we cycle to explore further northern reaches of the island. Late in the morning we board our boat to discover further northern reaches of Bai Tu Long Bay. This is followed by our return journey to Ninh Binh, arriving there for the night in our lodge. (Breakfast, lunch and dinner are included). We depart our lodge for a shoet transfer to Trang An Nature Reserve. From here we enjoy a delightful bicycling ride past tiny villages and a unique area known for its magnificent limestone peaks. Afternoon finds us boating along Sao Khe River then through beautiful caves. It is a great time to enjoy stunning landscapes. We absorb the daily life and appreciate the warmth and friendliness of the local people. Following that we board our vehicle for our return journey to Hanoi, arriving there at 5pm to 6pm. (Breakfast and lunch are included). - a 1-2 hour kayaking ride on Day 1 and Day 2. - a 4-6 km bicycle ride on Day 3. - a 8-10 km bicycling ride on Day 4. Transport: boat, kayak, bicycle and minivan. Meals: 3 breakfasts, 4 lunches and 3 dinners. Accommodation: overnight stay boat (1 night) and lodges (2 nights). 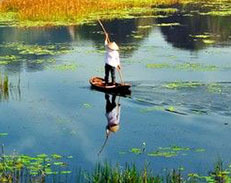 The trip cost: $255USD per person for a group of 10 to 12 people maximum. What to take: pack essentials, including light comfortable clothes suitable for outdoor activities, comfortable walking shoes.